The RV park and campground listings are below. If you know of any California RV facilities not listed here, please submit them and we will get them listed in the CA directory. We are the closest recreational vehicle park to San Francisco--just 10 miles north of the Golden Gate Bridge. The only privately-owned, public campground serving our six magnificent park systems - Point Reyes National Seashore, Golden Gate National Recreation Area, Samuel P. Taylor State Park, Mount Tamalpais State Park and Muir Woods National Monument, Tomales Bay State Park. 15 minutes south of San Francisco and offers its guests the only ocean-view RV sites in the area. Accepts large motor homes and towable rvs. This beautiful family camping resort is rated one of the top RV campgrounds in California and the premier campground & RV Park resort in the San Francisco Bay area. With 312 spacious sites on 70 Acres, this KOA offers the best in family, group and big-rig RV camping in a rural atmosphere. Candlestick RV Park is right in front of the Candlestick Stadium where the San Francisco 49ers plays football. park your motorhome or tavel trailer. Coyote Valley RV Resort is a Luxury Award Winning Top RV Park in North America located south of San Francisco and just minutes from the Silicon Valley and downtown San Jose, California with convenient access to Santa Cruz, Monterey, Carmel and Gilroy. Full service camping resort consisting of 170 sites. Monterey Bay Aquarium, Fisherman's Wharf, Pebble Beach golf course, surf breaks, Santa Cruz Boardwalk and endless miles of central-coast beaches are all within reach of the campground. Saratoga Springs is in the foothills of the Santa Cruz coastal mountain range. Campground offers a large clubhouse, kitchen, open pavilion, fire pits, solar-heated pool & spa, BBQ's, picnic areas, gorgeous views and much more. 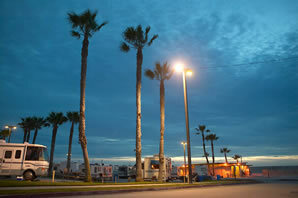 Golden Shore RV Resort is conveniently located on the waterfront in Downtown Long Beach. Make Malibu Beach RV Park your Southern California RV vacation and tour headquarters. You'll find many famous sight seeing attractions are easily accessible. Walnut RV Park offers modern RV Camping facilities in Southern California located in Los Angeles. Retreat to this campground with pine trees and a lovely San Gabriel Mountains backdrop. East Shore RV Park is located on the banks of stream fed Puddingstone Lake, which is stocked with trout and bass several times a year for the fisherman. An RV park capable of accommodating the smallest camper or very large RV's. Our accommodations and comfortable amenities will satisfy even the most particular traveler, and our full-hookup sites easily handle even the biggest RVs. Come and explore a natural wilderness campground on the Santa Ana River. Campground situated 1.3 miles South of Disneyland. Trailer & tent spaces available. Lake Elsinore Marina & RV Resort offers the very best launch facilities on the lake. Camp in the beautiful, ancient oaks of the Cleveland National Forest and San Mateo Wilderness Area of California. 110-acre resort located in Newport Beach, Orange County California at the entrance to the Back Bay nature preserve. Enjoy the unique experience of Southern California camping at Sacred Rocks, where affordable rates, full hook-ups, and first-class amenities such as our swimming pool. Our RV Resort is more than proud of our continual five star rating from Woodall’s and high ratings from Trailer Life just perfect for motorhomes and towable trailers. Offers resort-style camping, with landscaped grounds, paved roads, 200 full hookup motorhome and RV sites (including basic cable TV) and Wi-Fi. Just off Interstate 8, the major thoroughfare connecting San Diego's Pacific Ocean coast with the Californian desert, Arizona and all points east. Our campground is a beautifully landscaped resort with plenty of shade trees. Family and pet-friendly campground retreat that provides convenient access to San Diego County’s internationally famous tourist attractions. Our secluded 5-star RV and camping resort is located just 40 miles east of San Diego. Camping at Pinezanita is peaceful, quiet and clean. All of our sites are gravel covered with trees on every site for summer shade. Recreational vehicle owners, horseback riders, and wildlife lovers, this is the one camping place you don't want to miss! Closest to all that San Diego has to offer including the San Diego Zoo, Downtown San Diego, Old Town, Petco Park, and beautiful beaches, San Diego RV puts the best of southern California at your fingertips. RV Park offers sites that feature full hookups, extended cable TV, and phone connections. Ideal for RV owners wanting access to San Diego, Escondido, Orange County and the beach. Located on Mission Bay, with it's own luxurious beach, the campground is right across the water from Sea World, and within minutes from all of San Diego's area attractions. Our R.V. park and campground in the foothills of San Diego's North County with lots of green oaks, sycamores and cottonwood trees large motor homes and towables. Locate RV camping in Southern California and San Francisco Bay area.